LAT allows you to gather feedback, improve quality, increase stability and optimize the experience before you publish your app live for all customers to download. Your test results will show you exactly what your customers would see if the app were live in the Amazon Appstore. Submit your app to the App Testing Service. Submit the APK for your app to LAT. You can submit your app to LAT and App Testing Service concurrently. Your testers download and test your APK. Evaluate the App Testing Service results. Based on the test results and feedback, make any changes to your app. Re-submit to testing, as needed. 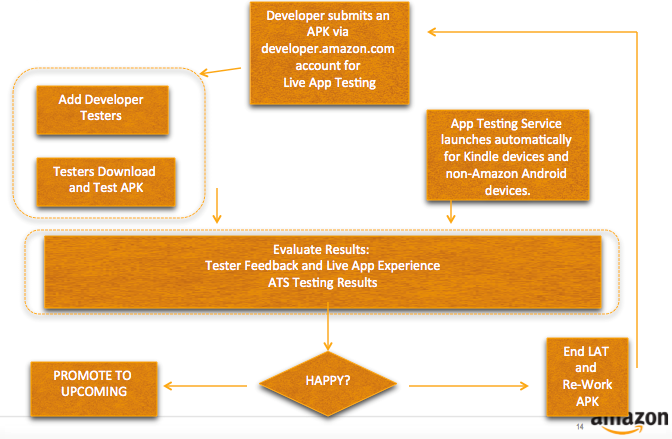 Once you are satisfied with your testing results, promote your app to be published live in the Amazon Appstore.